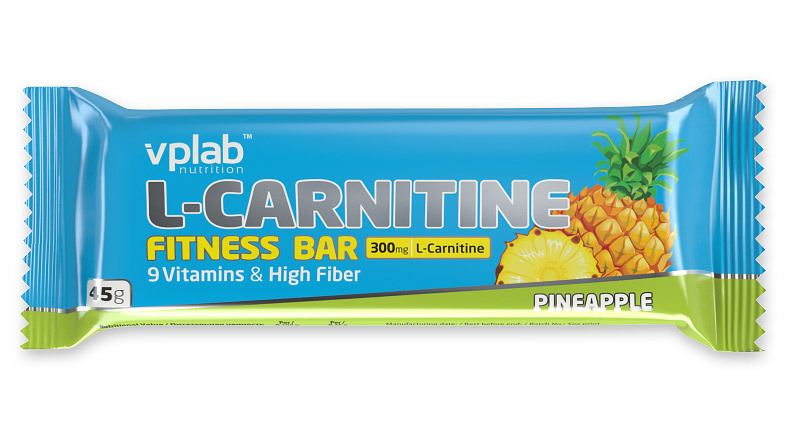 Yoghurt coated protein- carbohydrate bar with 300 mg of L-Carnitine per bar! Great pineapple taste, soft, but extremely tasty, balanced protein- carbohydrate content, 9 vitamins and dietary fiber make this bar absolutely indispensable! This low fat bar is delicious and contains only 177 calories, a real low calorie treat! Therefore, it is a very light snack before or after training. It helps recover after workout. It seems unbelievable but it also helps loose the weight and tone up using this bar after workouts. A great snack that helps body recover quickly from long workouts without being full of empty calories! Other ingredients: Yoghurt coating 20% (sugar, cocoa butter, skimmed milk yogurt powder, lactose, emulsifier (soya lecithin), flavoring, citric acid), glucose syrup, polydextrose, invert sugar syrup, milk protein, rolled oats, soy protein, rice flakes ( rice flour, wheat gluten, sugar, wheat malt, glucose, salt, emulsifier (soya lecithin)), raisins, pineapples, sugar-sweetened 3.8% (cane sugar, pineapple, citric acid), soybean oil, soy flakes (soy protein, rice flour , barley malt extract, salt), maltodextrin, L-carnitine tartrate, humectant (glycerin), flavoring, emulsifier (soy lecithin), vitamins (vitamin C (ascorbic acid), nicotinamide, vitamin E (tocopherol), calcium pantothenate, Vitamin B6 (pyridoxine hydrochloride), vitamin B2 (riboflavin), Vitamin B1 (thiamin hydrochloride), Folic Acid, Vitamin B12 (Cyanocobalamin)), color (lutein).